A startup called Voxel8 is using materials expertise to extend the capabilities of 3-D printing. 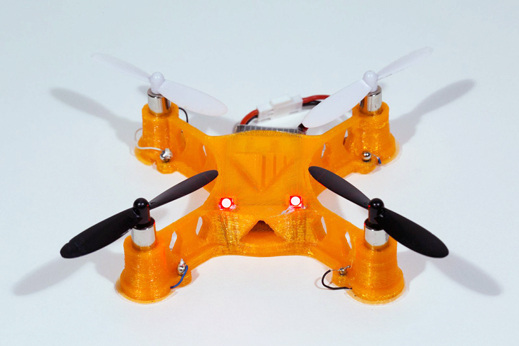 The quadcopter printed by Voxel8. Three cofounders of Voxel8, a Harvard spinoff, are showing me a toy they’ve made. At the company’s lab space—a couple of cluttered work benches in a big warehouse it shares with other startups—a bright-orange quadcopter takes flight and hovers above tangles of wires, computer equipment, coffee mugs, and spare parts. Voxel8 isn’t trying to get into the toy business. The hand-sized drone serves to show off the capabilities of the company’s new 3-D printing technology. Voxel8 has developed a machine that can print both highly conductive inks for circuits along with plastic. This makes it possible to do away with conventional circuit boards, the size and shape of which constrain designs and add extra bulk to devices. 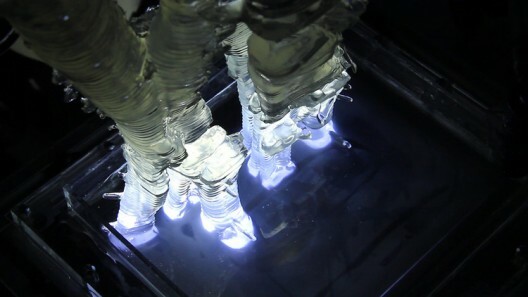 Conductive ink is just one of many new materials Voxel8 is planning to use to transform 3-D printing. The new ink is not only highly conductive and printable at room temperature; it also stays where it’s put. Voxel8 uses the ink to connect conventional components—like computer chips and motors—and to fabricate some electronic components, such as antennas. The company made the quadcopter by printing its plastic body layer by layer, periodically switching to printing conductive lines that became embedded by successive layers of plastic. At the appropriate points in the process, the Voxel8 team would stop, manually add a component, such as an LED, and then start the printer again. The toy looks like something that could be made with conventional techniques. The real goal is to work with customers to discover new applications that can only be produced via 3-D printing. A video the company made to show off its technology starts by asking: “What would you do if you could 3-D print electronics?” While the founders have some ideas, they really don’t know what the technology is going to be particularly useful for. 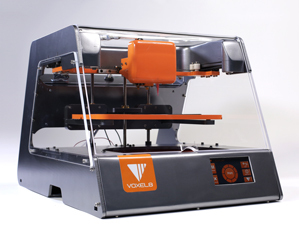 Voxel8’s business plan is to start by selling the conductive ink and a desktop 3-D printer. The machine is designed primarily to produce prototypes, not to manufacture large quantities of finished product. The company’s long-term goal, however, is to create industrial manufacturing equipment that can print large numbers of specialized materials simultaneously, which will enable new kinds of devices. The founders will draw on a large collection of novel materials—and strategies for designing new ones—developed over the last decade by cofounder Jennifer Lewis, a professor of biologically inspired engineering at Harvard (see “Microscale 3-D Printing). One of Lewis’s key insights has been how to design materials that flow under pressure—such as in a printer-head nozzle—but immediately solidify when the pressure is removed. This is done by engineering microscopic particles to spontaneously form networks that hold the material in place. Those particles can be made of various materials: strong structural ones that can survive high temperatures, as well as epoxies, ceramics, and materials for resistors, capacitors, batteries, motors, and electromagnets, among many other things (see “Printing Batteries”). The first time someone lays a 3D-printed piece of candy in your hand, you almost feel bad about eating it. The virtuosity of these pieces confuses the senses: stunning hexagonal structures cluster together like a complex chemical construction, full-color starburst patterns curve as if made from fabric, and neon geometrical shapes interlock without a single seam. On first glance, you think each one is a piece of art and meant to be consumed only by the eyes. But then you taste it and realize this is a whole new recipe. Sugar 3D printing is a relatively new development and a fun sense-oriented detour under the “additive manufacturing” umbrella, which has often been largely about function. Not to mention this is a huge development in 3D printing materials alone, especially considering that they’re all edible. No chemicals allowed. If we can 3D print with sugar, you have to wonder how many more materials are out there that we haven’t even considered yet. Most importantly, food 3D printing empowers us to build upon the culinary traditions that are so deeply imprinted on our cultural psyche. Food, as we can all attest, occupies a prominent space in the human experience. After all, we always seem to gravitate toward the kitchen as a gathering place, and one of the greatest pleasures of being human is making and enjoying a meal with someone else, whether it’s to catch up, celebrate, remember, or imagine the future. As culinary practices shift, so too do the experiences that surround them: they become heightened, enriched. This is exactly the kind of progression that food 3D printing will catalyze, as bakers, chefs, and confectioners take hold of capabilities never before realized, giving new shape to the moments of life that revolve around our food culture. The Sugar Lab at 3D Systems is the birthplace of sugar 3D printing. Think of it as our bakery and the place where all the amazing, sweet creations you see here come to life. Liz and Kyle von Hasseln, who began developing 3D printed food out of their small apartment while they were architecture graduate students, founded the Sugar Lab. For this husband-and-wife team, it started as a simple experiment with unusual 3D printing materials. They first attempted to print in wood, using sawdust, and later ceramics and concrete. Those all produced mixed results. But next, motivated by the need for a special birthday decoration, they tried sugar. After a few months spent perfecting the recipe, they realized they were onto something. A bit later, The Sugar Lab took form as a full-fledged business, with Kyle and Liz using a 3D Systems 3D printer that they’d retrofitted to be food safe. Now as part of the 3D Systems family, their amazing invention has taken the next step with the introduction of the ChefJet 3D printer, the first sugar 3D printer available for restaurants, bakeries, catering companies, and more. We first revealed the ChefJet at International CES 2014, and the excitement has rightfully been through the roof. Since then, candy giant Hershey’s has joined our efforts to find delectable and captivating new ways to print candy. As Kyle and Liz put it at CES, the ChefJet presents a fantastic new outlet for 3D printing to spread throughout mainstream culture. Food being such an integral part of our social interactions, our family gatherings, and our time at home, these edibles have the chance to open a lot of eyes to the personal power of 3D printing and its myriad uses. 3D-printed sugar sculpture for cakes and more. For those familiar with the different methods of 3D printing, sugar 3D printing is similar in principal to other technologies like ColorJet or Selective Laser Sintering (SLS). It uses a bed of powdered materials (in this case sugar), flavoring, and sometimes cocoa powder. A stream of water bonds the sugar together within the material bed to form a single layer, then the build platform lowers, a new layer of sugar is spread over the build area, and the machine builds the next layer. So it goes layer by layer until the sculpture is finished. The results, as you can see here, are just as magnificent as printing with plastic or metal. The ChefJet is virtually unlimited by the geometry or the complexity of the model you want to print. You can create interlocking pieces, perfectly straight lines, and smooth curves, all in full color if you desire. Considering the sugar sculptures that it creates, it makes sense that architects thought it up. Edible 3D-printed elements provide structural support for cakes. To date, The Sugar Lab and the ChefJet have created everything from customized sugar cubes and structural cake decorations to premium cocktail decorations and exact scale Ford Mustang replicas. Flavor choices are equally delicious with mint, cherry, sour apple, milk chocolate, and others. But what I love about the ChefJet and other 3D printers is that they provide yet another tool and a multitude of other options when it comes to artistic applications. I discussed this in last month’s blog: 3D printing in this respect can supplement the traditional methods, and recipes, that we’ve developed over years and years. In this case, it’s about building on tradition, not overpowering or replacing it. So now bakers and confectioners can match their delectable flavors with never-before-seen visual aesthetics. They can have their cake and eat it too. Shapeoko was the little milling machine that could. It surpassed its Kickstarter goal and went into production with the goal of supplying CNC mill fans with an easy-to-use and inexpensive ($300) CNC machine. Two years after the Kickstarter campaign concluded, creator Edward Ford has joined forces with Inventables to build the Shapeoko 2, which goes on pre-sale today. The second version features a completely redesigned Z-axis, dual Y-axis steppers, as well as Inventables’ MakerSlide linear bearing system. If you’ll be in Chicago on today (note: last monday), Inventables will be holding a Shapeoko 2 launch event where you’ll get the opportunity to see the machine in action. You can also pre-order the kit. The price is $300 for just the mechanics — just add electronics — or you can get a full kit for $650. Anjan Contractor’s 3D food printer might evoke visions of the “replicator” popularized in Star Trek, from which Captain Picard was constantly interrupting himself to order tea. 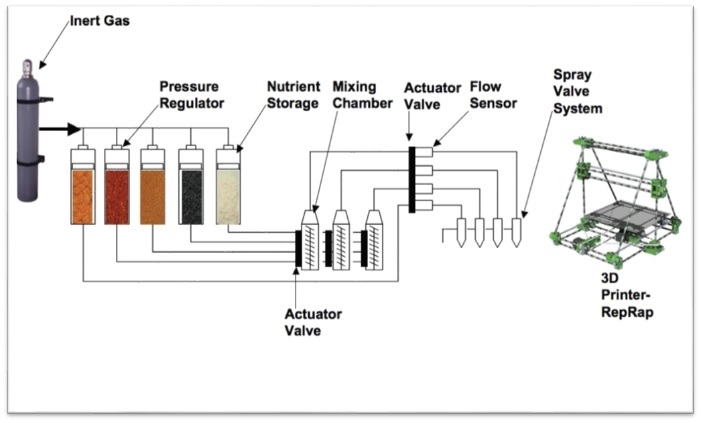 And indeed Contractor’s company, Systems & Materials Research Corporation, just got a six month, $125,000 grant from NASA to create a prototype of his universal food synthesizer. Ubiquitous food synthesizers would also create new ways of producing the basic calories on which we all rely. Since a powder is a powder, the inputs could be anything that contain the right organic molecules. We already know that eating meat is environmentally unsustainable, so why not get all our protein from insects? If eating something spat out by the same kind of 3D printers that are currently being used to make everything from jet engine parts to fine art doesn’t sound too appetizing, that’s only because you can currently afford the good stuff, says Contractor. That might not be the case once the world’s population reaches its peak size, probably sometime near the end of this century. If Contractor’s utopian-dystopian vision of the future of food ever comes to pass, it will be an argument for why space research isn’t a complete waste of money. His initial grant from NASA, under its Small Business Innovation Research program, is for a system that can print food for astronauts on very long space missions. For example, all the way to Mars. Pizza is an obvious candidate for 3D printing because it can be printed in distinct layers, so it only requires the print head to extrude one substance at a time. Contractor’s “pizza printer” is still at the conceptual stage, and he will begin building it within two weeks. It works by first “printing” a layer of dough, which is baked at the same time it’s printed, by a heated plate at the bottom of the printer. Then it lays down a tomato base, “which is also stored in a powdered form, and then mixed with water and oil,” says Contractor. Finally, the pizza is topped with the delicious-sounding “protein layer,” which could come from any source, including animals, milk or plants. The prototype for Contractor’s pizza printer (captured in a video, above) which helped him earn a grant from NASA, was a simple chocolate printer. It’s not much to look at, nor is it the first of its kind, but at least it’s a proof of concept. Remember grandma’s treasure box of recipes written in pencil on yellowing note cards? In the future, we’ll all be able to trade recipes directly, as software. Each recipe will be a set of instructions that tells the printer which cartridge of powder to mix with which liquids, and at what rate and how it should be sprayed, one layer at time. This will be possible because Contractor plans to keep the software portion of his 3D printer entirely open-source, so that anyone can look at its code, take it apart, understand it, and tweak recipes to fit. It would of course be possible for people to trade recipes even if this printer were proprietary—imagine something like an app store, but for recipes—but Contractor believes that by keeping his software open source, it will be even more likely that people will find creative uses for his hardware. 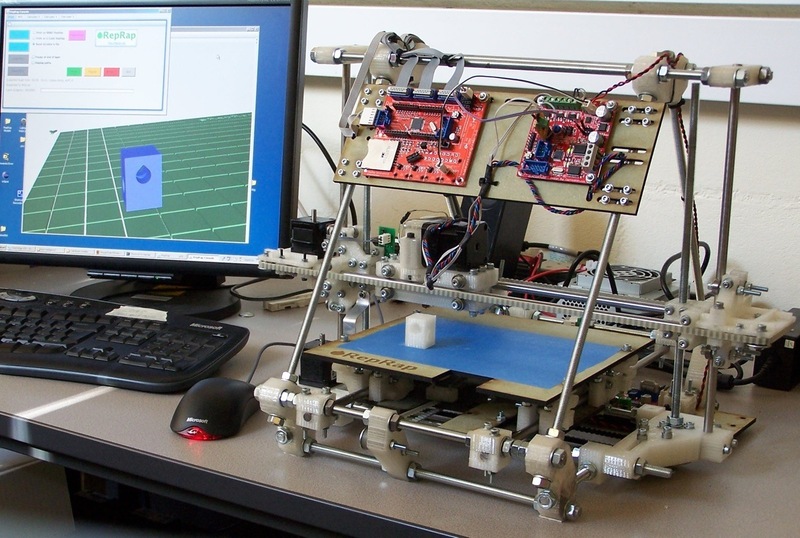 His prototype 3D food printer also happens to be based on a piece of open-source hardware, the second-generation RepRap 3D printer. Contractor is agnostic about the source of the food-based powders his system uses. 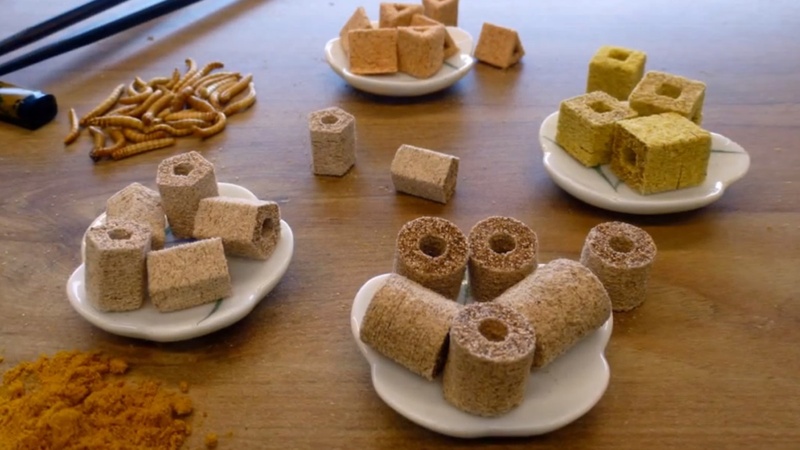 One vision of how 3D printing could make it possible to turn just about any food-like starting material into an edible meal was outlined by TNO Research, the think tank of TNO, a Dutch holding company that owns a number of technology firms. 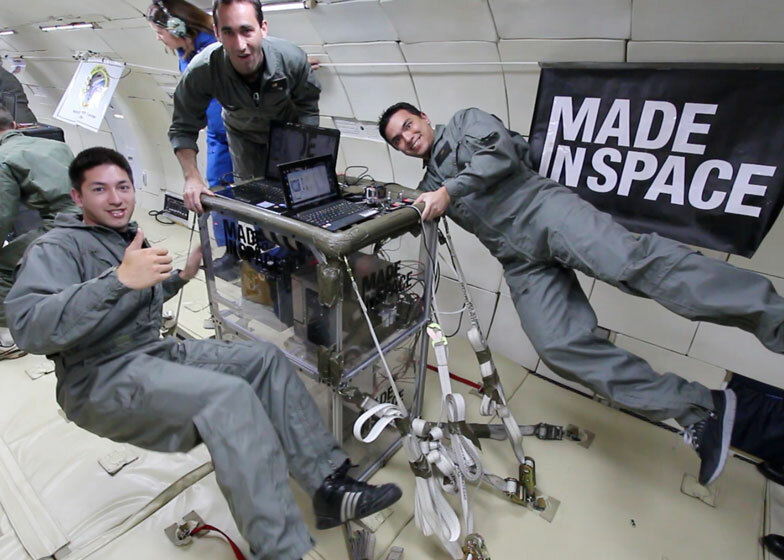 While Contractor and his team are initially focusing on applications for long-distance space travel, his eventual goal is to turn his system for 3D printing food into a design that can be licensed to someone who wants to turn it into a business. His company has been “quite successful in doing that in the past,” and has created both a gadget that uses microwaves to evaluate the structural integrity of aircraft panels and a kind of metal screw that coats itself with protective sealant once it’s drilled into a sheet of metal. Since Contractor’s 3D food printer doesn’t even exist in prototype form, it’s too early to address questions of cost or the healthiness (or not) of the food it produces. But let’s hope the algae and cricket pizza turns out to be tastier than it sounds. But would it be given to Adrià Ferran, it could start to look and taste like something! But we could also put this in perspective with the recommendation from UN (Food & Agriculture) that humanity should eat more insects in the future, both because it needs less energy and produces less carbon dioxide to produce 1kg of insects (2kg of food produce 1 kg of insects while 20kg produce 1kg of meat...) and because they provide good and healthy nutriments. 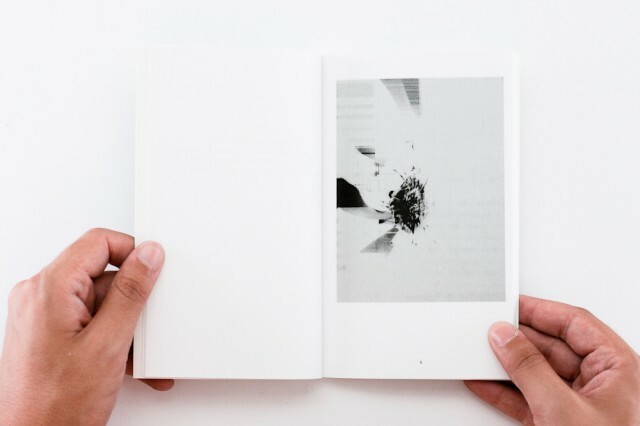 As many people still don't like to eat insects due to their aspect, turn them into powder and print them might be an interesting way. Mini(Print)-me out of my own garbage? Note: I'm joining here two posts that hit the blogs recently. The FilaBot 3d printer that print from garbage and the sort of narcissic-souvenir 3d photo booth from Omote 3d. Will it become possible to 3d print snapshots of ouselves, our houses, even our food with our own garbage (including therefore food garbage...)? Which would be a decent way to recycle trash (best way actually might be distant heating). Of the many fictionalized, futuristic innovations shown in the Back to the Future movies, one of the most beneficial belonged to the DeLorean at the center of it all, and I don’t mean the ability to time travel. Rather, if even regular engines could run on garbage, we’d solve the issues of fuel availability and waste disposal in one fell swoop. That’s why it’s nice to see that this concept has come into existence right at the upswing of the 3D printing phenomenon. FilaBot is a desktop device that breaks down various types of plastics and processes them into filament that you can use for your home 3D printer. That includes your botched 3D printed experiments, so you won’t be wasting filament when you’re testing out a design. Their Kickstarter campaign, which closed in early 2012, clocked three times its goal, and should prove to be a great accompanying device for home 3D printers like MakerBot. Founder Tyler McNaney plans to create a whole range of products that offer this functionality, some with great potential for customization. FilaBot is a welcome arrival to a burgeoning world of creativity that threatens to create an immense amount of waste, something that we’re already pretty good at rapidly creating in large volumes. Now, instead of adding to the garbage pile, we can process some of our existing waste into something useful… well, depending what you’ll be designing and fabricating. Un photomaton d’un nouveau genre vient de voir le jour à Tokyo: il crée une figurine à l'image du modèle. Complètement mégalo mais idéal pour les amateurs de petits soldats de plomb. Omote 3D propose aux Tokyoïtes de leur tirer le portrait et de réaliser leur figurine en 3D. - D.R. A priori ce n’est qu’un gadget de plus pour consommateurs en mal d’ego trip. Mais les figurines créées par Omote 3D, photomaton installé pour quelques semaines à Omotesando, coeur de la consommation de luxe tokyoïte, prouvent que l’impression 3D est en passe de devenir un produit grand public. Le Pop up studio ouvrira dans une galerie de Tokyo le 24 novembre prochain. On pourra s'y faire tirer le portrait, à la façon d’un photomaton - mais avec l'aide d'un photographe professionnel. Le portrait sera ensuite scanné et à partir des données enregistrées, et une figurine à l'image du client verra le jour. La machine, appelée Omote 3D, propose donc de transformer le chaland en petit soldat de plomb – mais en plastique et sans fusil. Pour 200 euros (la figurine de dix centimètres), le laboratoire Party, Rhizomatiks et Engine Film livrent l’objet, qu'il s’agit ensuite de colorer soi-même. Les prix sont encore assez élevés mais la technique en est à ses prémices : de 21 000 yens (200 euros) pour une figurine de 10 cm à 42 000 yens (400 euros) pour la plus grande version de 20 centimètres. En juin dernier, durant les Designer's day, les Français de Sismo proposaient déjà aux visiteurs de modeliser leurs visages et les faisaient surgir de pièce de monnaie. Le studio Sismo édite également des reproductions de crânes, vanités des temps futures, contre quelques milliers d'euros. An interesting twist with 3d printing: to use it as a way to recycle our old PET bottles or plastic trash (and by extension any trash, including organic waste to 3d print food?). And a way to potentially produce strange self consumption portrait. SCI-Arc Gehry Prize 2012 - Phantom Geometry - Kyle & Liz Von Hasseln/Advisors: Peter Testa & Devyn Weiser from SCI-Arc on Vimeo. SCI-Arc Masters of Architecture graduates Liz and Kyle von Hasseln have been awarded the inaugural Gehry Prize for developing an interruptible 3D printing method, dubbed Phantom Geometry, that allows designers to make alterations to the design while it is being printed. The Phantom Geometry method is a convenient alternative to the conventional, static 3D printing systems available today. 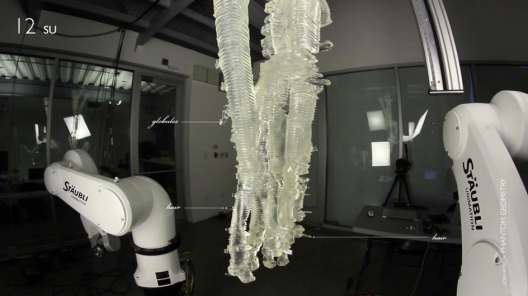 The system’s main components includes a UV light projector, a special photo-sensitive resin, and controlled robotic arms from SCI-Arc’s Robot House. More about it on ArchDaily's website. See also the project ProtoHouse by Softkill Design in the area of digital fabrication (obviously a technology that is actually in the "peak of expectations" phase of the hype cycle for emerging technologies graph). Affordable hardware has it’s benefits and problems. As cheap electronics become widespread and more available, we become less protective of them. No longer we purchase cases or try to protect them. 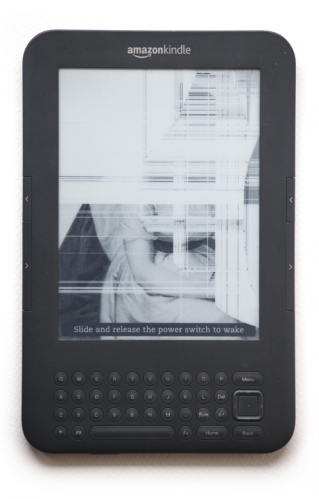 Kindle, costing mere $7o is one of those devices, your library is in the cloud, if lost or broken it’s easily replaced. 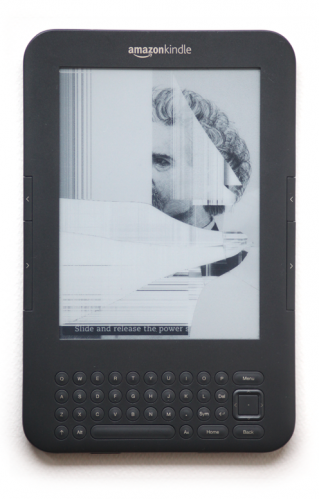 What happens with all the broken, lost or damaged Kindles? 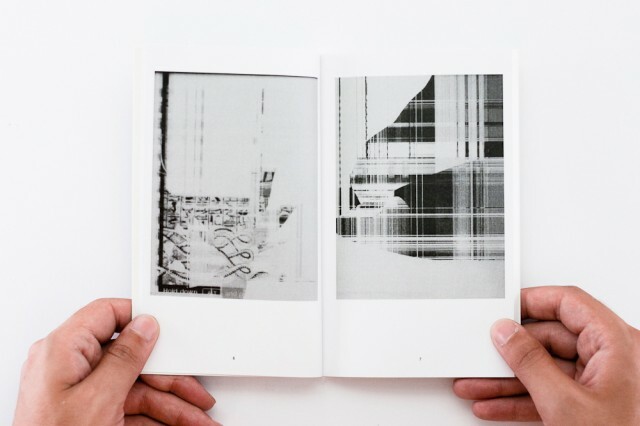 Belnjamin Gaulon and Silvio Lorusso+Sebastian Schmieg try to address this, building on the glitch aesthetic and reappropriating Kindles into art objects.